Our service department is always open to assist in the servicing of your heating and cooling equipment. Our Service Technicians are fully licensed and experienced in the repair to all makes and models of gas-fired equipment. To further enhance our service department, all customers are entered into our computer database. Each customer profile holds valuable information concerning the customers' gas-fired equipment, including make, model, serial numbers and any previous service work. This information has proved to be invaluable for helping our Service Technicians in the servicing of our customers' equipment. We are committed to providing our customers with superior service at reasonable rates. No ductwork, no problem. Try a ductless air conditioner for added summer comfort and dehumidification. Separate indoor and outdoor units. Remote gives you programmable time and temperature control. Ideal for commercial computer rooms. Electrical baseboards to natural gas forced air. Oil to gas forced air and blower conversions. Hi-Efficiency forced air furnaces and air conditioning. Humidifiers, Air Cleaners, and air quality products. Heat loss - heat gain calculations with drawings and municipal permits as required. When your heating or cooling system is not working properly, call Northwest Gas. Our hvac technicians service all brands of heating, cooling and home comfort equipment. We offer 24 hour emergency service, and our service vehicles are located throughout the GTA, so we are always nearby. When you need furnace repair and service, count on the experienced technicians at Northwest Gas. Each is a factory-trained and certified employee, experienced in the service and repair of all major brands of furnaces, boilers and heating systems. 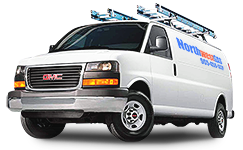 Northwest Gas vehicles are fully stocked with the tools and parts to repair your heating equipment properly - and as quickly as possible. Northwest Gas specializes in the sale, installation, servicing and repair of residential and commercial heating and air conditioning equipment. We have serviced the GTA's heating and cooling needs since the 1985 and provide the following services to the consumer at competitive prices. For more information give us a call at 905-458-1021.